Its important to mention that we remove bee swarms in Missouri: Greene County, Christian County, Lawrence County and Webster County, Please call us first to save the bees for fast, friendly and FREE bee swarm removal. 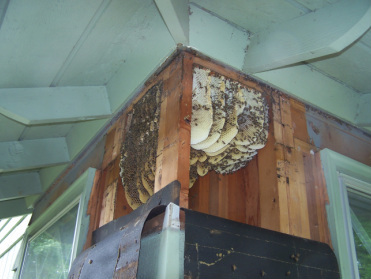 Do you have honeybees in your residential or commercial property? We will remove them safely and protect your home or business from future bee occupations. Killing the bees and sealing the hive entrance is NOT the answer. The dead bees, honey and protein-rich pollen will decay within the walls causing structural damage. Furthermore, the honey and pollen will attract more bees and many nuisance species including ants, cockroaches and raccoons. We will take the bees out of the building and away from the property quickly, safely and efficiently. We relocate the honeybees to a healthy and productive environment where they can continue their natural role. Honeybees pollinate the plants and fruits we eat and produce the honey that we love. Call for more information and an estimate. Costs are determined by the complexity and size of the honeybee hive removal.